There Are Plenty of Places to Stay in Kingston, Ontario! Ah, Kingston. So you want to explore this historic Canadian city but you need a place to sleep? You are not alone! Playing tourist in Kingston is a lot of fun – just take it from Eric! Having lived in Kingston for a number of years, he knows a thing or two about where to stay in Kingston. If you are looking for accommodation in Kingston, there aren’t a crazy number of places to choose from. However, this actually makes it easier to book a hotel or inn that works best for you. The good news is that the available options are really good and in great locations like right downtown or on the waterfront – from the Holiday Inn to the Hochelaga Inn. Some of the Best Restaurants in Kingston! For this post, we have split Kingston up into three main areas. They are: Downtown, Midtown, and Near Highway 401. Below, we explain why you’d stay in each of them in more detail. We even give you a suggestion or two. Boat tours leave from here – and the Holiday Inn Waterfront is in this photo, too (back left). With the hustle and bustle going on, Downtown Kingston is where most people end up staying. The historic waterfront is a hub of activity and downtown i full of the best shops, bars, restaurants, and attractions. As a visitor looking to be a tourist in Kingston, this is where you should stay. Most accommodations downtown have parking so you can feel confident about leaving the car for a few days while you explore on foot. You can scroll down to see some hotels in downtown Kingston and bed and breakfasts right downtown, as well. We are defining “midtown” as everything that is not downtown at the waterfront and everything that is not up by highway 401. It’s a large area – but there aren’t a ton of options and frankly, as a tourist you’d likely want to stay closer to the action (unless you have a car). A few options are places like the Travelodge Hotel – it’s not close to the downtown attractions but it’s right on Princess Street and they have an indoor pool. Another option is the Ambassador Conference Hotel. Eric has stayed here a few times – it’s been great each time. The Ambassador has loads of parking, an indoor pool (with awesome water slide), and an onsite restaurant. You’ll need a car/cab to get downtown but it’s close to the train station to catch the ViaRail to Toronto or Montreal, for example. If you are looking for hotels near the 401, you can find them off the highway at the Division Street exit (#617). If you are passing through the city, these hotels have restaurants close by and have easy access to get back on the highway. There are most of the big names up here like Holiday Inn Express and the Courtyard by Marriott. However, these are not close to downtown Kingston and you cannot walk, just to be clear. As we said, a good option for a rest but not to play tourist. For our sake, we are going to focus on the hotels and inns downtown since a vast majority of visitor would stay here to get the most out of their visit. Staying downtown just makes the most sense – you can walk to all the best attractions, bars, restaurants, etc. without needing a car. Here’s the Tourist Centre – you can see the Delta behind it! Since they are so popular (for plenty of good reasons), let’s highlight a few hotels right downtown. Most of these are right on the waterfront for really great views. Many of them are affordable, too! Eric has also stayed at some of them. Located right on the waterfront across from where the boat tours take you to the 1000 Islands, the Holiday Inn Waterfront is a really good option. Many of the rooms have lake views which is lovely. They are pet-friendly, have parking, an indoor and outdoor pool (season permitting), and an onsite restaurant – but you are so close to downtown that you can just go out for dinner! Also very close to the waterfront, Confederation Place is another affordable hotel right downtown. Eric stayed here years ago and had a nice time. Confederation Place Hotel is pet friendly, has parking, a small outdoor pool, and restaurants close by! The views of historic downtown or the lake are an added bonus. If you want to up the price point a tad, check out the Delta. Also located right at the waterfront close to the best attractions and top restaurants in Kingston, the Delta is a great hotel option. The Delta is pet friendly, has parking onsite, a fitness centre and indoor pool, and AquaTerra (a very, very good Kingston restaurant). Rooms have lake views – and you can walk everywhere! The other accommodation type Kingston is known for is its inns – sometimes called Bed and Breakfasts. The city is full of histotic homes that play host to quaint getaway spots all over downtown Kingston. Located downtown close to the waterfront and City Park, Hotel Belvedere is an inn with loads of space and old world charm. Rooms have large beds, private bathrooms, and the outdoor space has a terrace used in the summer months. There is free parking onsite and they serve a light continental breakfast with coffee from a local company! It’s an old building and a quick walk to Princess Street restaurants through the old neighbourhood – what’s not to love? Located in one of the coolest old buildings in the city (Eric’s opinion), the Hochelaga Inn is definitely worth looking at. The neighbourhood is quiet and beautiful – and the property fits in perfectly. The Hochelaga has loads of charming rooms with modern amenities, air conditioning for the summer, a really good onsite breakfast, and parking onsite. The inn, however, is not pet friendly. Located in the same historic district as the others, the Rosemount is another beautiful historic building that welcomes guests from all over the world. It has large traditional rooms with air conditioning, onsite gourmet breakfast, afternoon tea, and more. There is even a spa for massages, facials, and wraps. 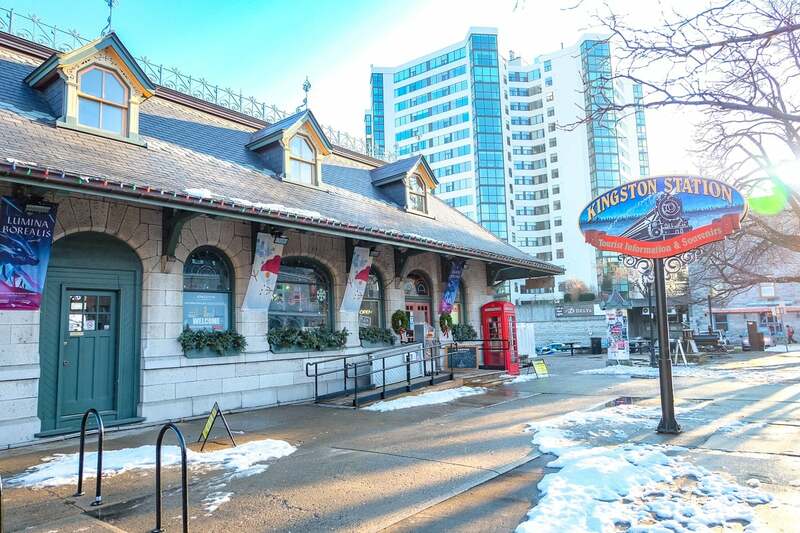 If you want a classic “inn experience” in Kingston, the Rosemount might be for you. And there you have it – a quick rundown of some of the best places to stay in Kingston, Ontario. Whether you want a hotel or a bed and breakfast, you are sure to find a place that serves your needs. Have fun – and let us know where you ended up staying!